Naples, NY is famous for its grape pies, made from tangy concord grapes. I adore them! So when I visited in autumn, I talked to the region's biggest seller: Monica Schenk, owner of Monica's Pies. Monica shares how she went from stay-at-home mom selling pies at an unmanned roadside stand to national baking sensation. These days Monica's Pies is open year round selling some 60,000 pies each year, but she's as down-to-earth as ever. Meet Monica, owner of Monica's Pies in Naples, New York. Rosabelle grapes in the background, Monica's pie with a floating crust top in the foreground. Subscribe to Beyond the Table on Apple Podcasts, Stitcher or wherever you listen to podcasts. You can also find us on Facebook, Instagram and Twitter. My hometown of Rochester, NY is most famous for inventing The Garbage Plate, a calorie packed, meat-heavy monstrosity that gets all the culinary glory (and publicity)! I finally tried it when I visited this autumn, so I'll give you my unbiased verdict. 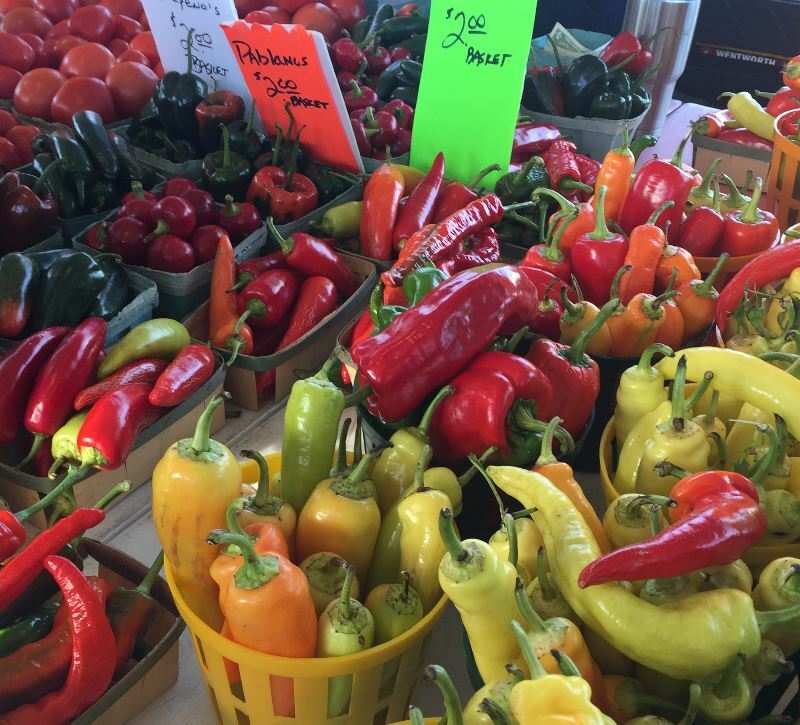 But Rochester has much more to offer food lovers, and if you want a taste of the city's culinary diversity, the Rochester Public Market is the perfect place to start. In this episode we'll take a mini tour. You'll meet Mark, the spicy pickle meister (and take a quick look at the health claims around pickle juice), talk purple cauliflower, apple personality types and much more. Founded in 1905, the market is the place to go for eclectic buskers, quirky politicians and super fresh produce. Meet the creator of delicious spicy pickles. The references in this article are worth checking out if you're interested in the health claims around pickles. If you go to Rochester (you can detour on the way to Niagra Falls!) then you should definitely visit the public market. They even do tours. Music in this episode was recorded at JollofWars and is by Malin Sylla of Afro Nomad. The Africultures Festival is coming on 10 March in Lidcombe (western Sydney)-- I've never been but it sounds awesome! Cassandra (left) and Tope (right) from Nigeria cooked the winning jollof at the 2017 JollofWars held in Auburn. Monique is the irreverent and opinionated co-owner of The Rooster, a traditional French Restaurant in Katoomba. She's a storyteller with an adventurous spirit who is on a mission to bring fine food to regional Australia. Eddie Zanbaka, owner of Belmore Lebanese Bakery, on the art and science of baking, growing up catholic in Lebanon, adjusting to life Down Under, the investment that changed his career and finding happiness in simplicity. Belmore Lebanese Bakery specialises in made-to-order flatbreads and fatayars that Eddie has perfected from years of experience--with some help from a master Lebanese baker. Special thanks to James Mcgowan of jamesmcgowanaudio.com for his help on this episode-- I had significant problems with the recording quality on this and thought it was going to be completely unusable, but he worked his magic and made the episode 1000 times better. Eddie Zanbaka prepping one of his famous oregano rolls, with a marinated lamb flatbread in the foreground. Freshly baked, flakey and perfectly browned, and stuffed with a blend of halloumi and feta--not pictured is the perfect flat white that I drank with it. I recommend both! Too hungry to worry about pretty pictures. Subscribe to Beyond the Table on Itunes, Stitcher or wherever you listen to podcasts. And add us on Instagram or Facebook. Not Just Curries quickly earned the number one spot on Trip Advisor in Harris Park-- a neighbourhood known for its top Indian food. Vivek Gulati is the head chef and one of the three co-owners. Vivek owned three successful restaurants before a series of health problems led him to change his plans. Listen to his story-- and the fascinating stories behind Not Just Curries. After years of working in retail and focusing on being a Mum, Lay Lay Naing fulfilled a life long dream when she opened The Burman Kitchen last year. She shares her stories and love of Burmese cuisine here. Check the Burman Kitchen out on Facebook here for some tantalizing pictures of their food! 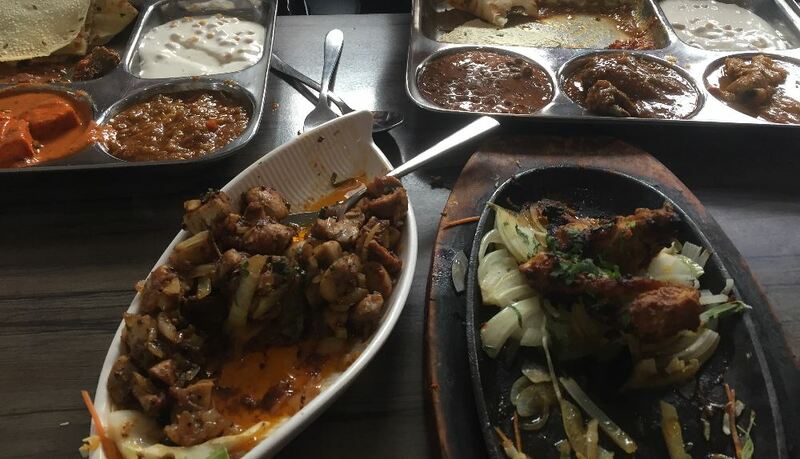 The Burman Kitchen is at 44 Railway Parade in Granville, New South Wales (02 8677 0152). You can subscribe to my podcast on Stitcher here or on iTunes here (if you do it on iTunes, drop me a line and tell me so I can get an idea how many people are listening). You can also search for Beyond the Table in whatever other subscription service you are using.